We’ve been in business in the Bay Area for more than 80 years, and we’re proud of our longstanding relationships with both customers and the other service partners with whom we collaborate. These are people who value quality work and customer service–they hold themselves to the same high standards to which we hold ourselves. 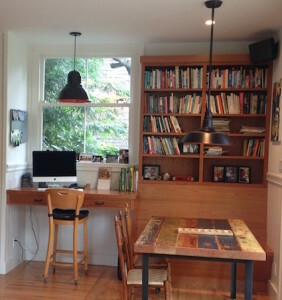 Roberts Electric recently completed the electrical on a remodeling project for a family room and bathroom for Berkeley architect Caitlin Lempres Brostrom, of First Bay Architecture. We’ve collaborated with Caitlin on several projects, so we were delighted to do the electrical on her home. W.A. Rose was the contractor on Caitlin’s job—this relationship goes back to 1960, when Dan’s father and mother, Don and Cora Pitcock, first began partnering with Rose—that’s an astonishing 55 years working with W.A. Rose on quality construction projects! The goal of this project was to expand the functional living area at the rear of the house, which required repositioning several rooms. The laundry room was moved to the basement, and the powder room was relocated into what had been the pantry. The single window and door onto the patio was replaced with a sliding French door and an overhang–into which we installed recessed LED light fixtures. We rewired and upgraded the electrical, installing overhead recessed LED lights in the family room as well as individual LED light fixtures over the game table and desk. With its hardwood floors, built-in cabinets, bookshelves and soft LED lighting, this is now a warm, inviting, functional room in which this family gathers to work and play.